Shot blissfully in black and white, Noah Baumbach brings Frances Ha to life in a coming-of-age story for the young adult. I found myself resonating with it when it was all said and done. It’s a film that sort of tugs at your youth and what it feels like to struggle and let go. Frances (Greta Gerwig) is a 27 year old pursuing a stable career as a modern dancer at her local dance company in New York. For the moment, she’s apprenticing there as she navigates the other things in her immediate life. Frances Ha is an inspiring and artistic look at a vital stage of adulthood. From the start of the film, it’s noticed how much Frances’ youthful and giddy friendship with longtime bud, Sophie (Mickey Sumner), plays a huge role in her life. It’s the ‘saying I love you’ kind of bond the roommates share, and Frances finds a dependence in it. On the train one day, Sophie tells Frances that she’s thinking of not renewing the lease, as Frances thought, and moving to her dream neighborhood of Tribeca. Frances is forced to find a place to live, and in doing so, is forced to find her independence and grow up a little. She moves in with two hipster-esque guys (Adam Driver & Michael Esper) in Chinatown. From there, we see her relocate a few more times and struggle to find the means of getting by. Her relationship with Sophie gets tested, her current job becomes unpromising, and she completely relies on a new credit card to pay for a two day trip to Paris, France. She’s the kind of person that will speak her mind and then when it’s already too late, begin to pull away on her actions. Gerwig gives a pleasant performance as a quirky gal with a unique sense of humor and messy attributes. Her decisions were at times poor. Her success was always attainable, but her will to take control was lacking. Frances Ha really was depressing at times to see our extremely likable character pass by, but it is because of her likability that we keep watching. She’s clumsy and disorganized, but full of that reminiscent hope. Gerwig and Baumbach take credit here as co writers and develop a script that speaks to us on many levels, especially if you’re a young adult trying to find your self sufficiency in the world. We see a little piece of ourselves in some fashion here. When Frances realizes that her best friend is finally growing her own wings, it makes me remember a time where life wanted me to grow up, too. It sometimes happens suddenly, other times with a heads up. We are dealt situations that expect us to springboard off our asses and smarten up, and that’s okay! The film knows this and communicates it very straightforwardly. 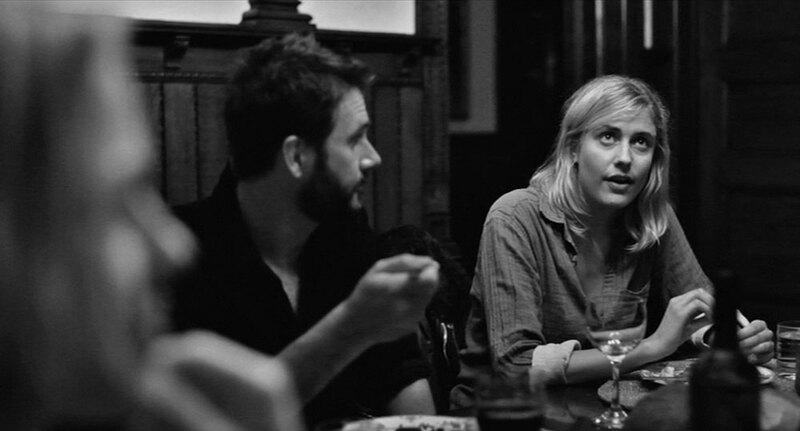 Baumbach gives us a taste of young adulthood in a very fine manner. Taking a loose influence from Woody Allen’s Manhattan, I thought the absence of real colors was an ingenious approach. In the essence of New York’s quality, Frances Ha replenishes a thirst for French New Wave vibes. It’s all character and no color importance. In fact, it accentuates the story. At no point did it feel lackluster and boring. We see a completely capable adult find her way to see if her ambitions are fantasy or reality. Thirty minutes in, you’re wondering what the real plot is in the film, and then it hits you- this is a period of our lives on display. There’s a lot to digest if you think about what you can take from the film. Frances doesn’t have her life together for a chunk of the film, but hey, she’s figuring it out. We’ve all been there. This film gives us comfort in knowing that each day is a stepping stone for what’s to come.